Maggie Worku ’07, an associate director with Transamerica, in Atlanta’s Commerce Club. SINCE 1960, Atlanta’s Commerce Club has been the gathering place for history-shaping meetings, especially in its former location in the Five Points neighborhood, surrounded by banks, law firms, the offices of the Atlanta Journal-Constitution, and Georgia State University. In 2010, the prestigious club followed the migration of many of these institutions south to its current location on the 49th floor of 191 Peachtree Tower. 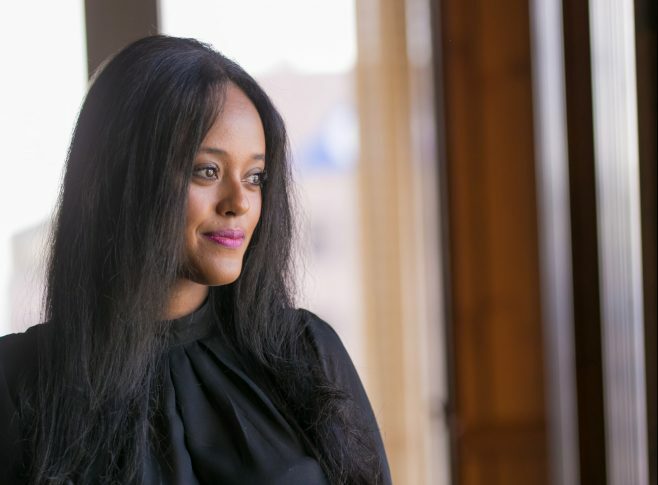 Maggie Worku ’07 – Ethiopian native, Transamerica executive and entrepreneur – is a part of this new history. She often hosts prospective recruits, conducts training sessions, and meets clients in one of the many work spaces or the dining area. The views from the wall-to-wall windows are stunning, useful for both inspiration and distraction. 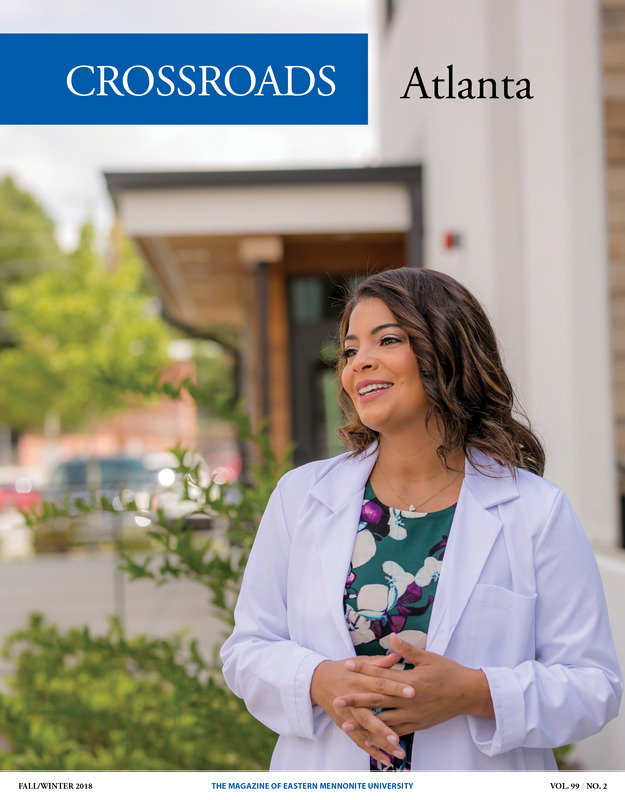 Her favorite looks southeast – “I think,” she says: “I get turned around in here.” Known city-wide for its business networking opportunities, time at the club is always well-spent. From an early age, Worku was exposed to the business world. Her father, a civil engineer, and her mother managed businesses in construction and import/export in Ethiopia. Her brother Yohannes ’07, with whom she came to Lancaster Mennonite School (LMS) and then on to EMU, is now a regional vice president at Transamerica. One younger sister is a civil engineer completing doctoral studies and teaching in Addis Ababa, Ethiopia; the youngest travels Africa as a sourcing director for Diageo based out of Nairobi, Kenya. It was Yohannes who urged her to consider working in insurance after she struggled to find her professional niche. Her current work feeds her desire to be helpful to others while also offering time and financial support for other interests – such as developing a fledgling import retail business inspired by global travels. In 2017, Worku visited 11 countries (she maximizes her time by including visits to adjacent countries). One favorite trip was a solo 2015 visit to Egypt to see musician Yanni in concert with the pyramids as the backdrop. At EMU, she chose a business major, but her interests were broad. She still has the form that she and her counselor filled out during the first semester, a plan that enabled a double-major in economic development and international business and a triple-minor in justice, peace and conflict studies, marketing, and computer information systems. She balanced this intense coursework with a job in Multicultural Student Services and extracurricular involvements (the most formative was Students In Free Enterprise, now known as Enactus). Those early inclinations towards innovation, entrepreneurship and self- motivation are evident in her business pursuits. She prefers working for herself, managing her own time, and developing her own future and that of her clients through personal interaction. She guides her younger clientele through important financial decisions and helps those 60 and older through the maze of rules and regulations surrounding retirement. Close to her heart are the interactions she can’t forget: bringing a life insurance check to a grieving family overwhelmed with bills, informing a teenage orphan that his mother had not purchased a policy that would have enabled him to continue supporting him and a younger brother. Times like that leave her questioning her own persuasive abilities. Worku’s own assessment of her fortunes, so far, is that she has been “pretty lucky, honestly,” in the life she has created in Atlanta, considering she came knowing only one person and had no job lined up. She has capitalized on her natural strengths but also developed new skills and knowledge. She remains grateful to her parents for the role they have played in her independence and success. And now Atlanta – her many friends, her boxer Bella, a thriving Ethiopian community, the varied pace of the urban setting, the warm weather and endless entertainment options – feels like home, a place to grow roots and build a future.